The eight of us headed towards her recommended seafood place near Tropicana area called P.J. Seafood Restaurant. I was told that this place used to be super popular in the older days but due to other competition and major road changes, the restaurant is kinda quiet now. 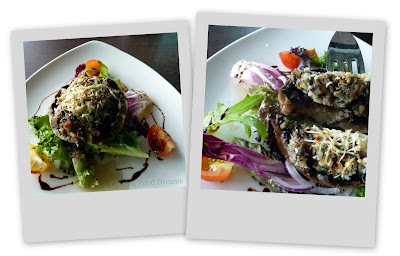 The star of the restaurant is SEAFOOD and thus we ordered its signature Crab dishes with other additions. Let's get down and dirty to this seafood galore. Some of its daily specials that night. First up, Fried Yau Mak with Garlic. The dish was simple and average but not much wok hei though. Ginger Wine Clam Soup was next. Ooo.. this is good..the portions of clams were gigantic and I managed to had two soup bowls brimming with clams. Clams were fresh and soup was really tasty. We started to get worried about the number of dishes we ordered that had yet to show up. Next up, Oyster Omelette arrived and there was this dash of the gluttons diving into the dish with gusto. Unfortunately, it kinda tasted flat as I felt it was just scrambled egg with oysters. Oysters were small and not much. Some of us could not even find any. There was also no special chili sauce for this dish. Mantis Prawn Kung Pao style came and this is heavenly astounding. Pieces of lightly coated mantis prawn, crisp and juicy, bathed in a beautiful kung pao sauce was just divine! Supporting its main star was dried chilies, crunchy onions and scallions. The size of the mantis prawn was big, hence one could really taste the prawn instead of the batter. I simply love this dish and had to say it is was really well done. Most of my other experiences with this dish was over battered and dried out mantis prawn. Thumbs up for this one! Another average dish was the Salted Steamed Malay Chicken. To my taste bud, it seemed to lack of any flavour. The chook texture was average but taste wise was kind of bland except for some saltiness. Our main superstar came although we were still trying to finish our rice dishes. Spicy and sour Crabs were "lip smack-e-lious" awesome. Lots of sauce with just the right spiciness and sourness, this is really good for mopping up with bread. Crab size was decent and 1kg yield 3 crabs at RM38. So glad the Deep Fried Man Tao came next, which I hastily grabbed and doused with the crab sauce. Toasty and crispy but not oily. Mmmmmm... need I say more? If I thought the spicy and sour crab was awesome, Spicy Butter Crab outshone its competitor and won the Best Actor role in the whole show! Luscious and creamy, the buttery sauce was smooth, spicy and really mouth-watering. I just kept spooning the luscious gravy into my mouth and drowned it on the man tao as well. Claypot kept the crab warmed but not before all the gluttons devoured it. Double thumbs up for this and I would come back just for this dish alone! Stir Fried Hong Kong Kai Lan with Garlic was good. Crunchy and well seasoned, this provided us with our veggie vitamins for the day. We wanted grilled sting ray but it was not available, hence the lady boss recommended Salt and Pepper Sting Ray. Another missed dish! Over battered, one cannot really taste the sting ray and flavour was not right. After our last crab dish, we decided to order another crab dish since we felt that the gluttons in us still had room for more of this divine crustacean. After all the heavy sauced dishes, we decided on the Steamed Crab with Egg White and Wine as recommended by the lady boss. Gloriously bright red, the crabs was really fresh and sweet. Egg white and wine was only ok as I could not really taste the flavour but the meaty crab more than made up for this. Another good dish to order for simplicity and freshness. Overall, few hits and misses. Ambience is quite decent as it is open air and one could feel the breeze that night. Plenty of fans as well to keep the place cool. Total bill for 11 dishes and rice with chinese tea was RM 317. Value for money as portion was quite big. MSG is present in the dishes. I would go back for the hits for sure. Shrimp, Prawn.. whatever its called, these luscious crustaceans have certainly found its way here. I was hanging around The Curve when it dawned on me that there is this seafood place that has probably been blogged to death which I haven't tried. Prepared for my serious seafood quota of the month, I spear headed there with utter delight like a child who has just found some obscene amount of candies. Anyone who watches the timeless movie Forrest Gump would remember this restaurant's name ~ Bubba Gump Shrimp Co. For those who still haven't watch this classic, please do as it is one of the most meaningful movie ever made that won the hearts of many fans! 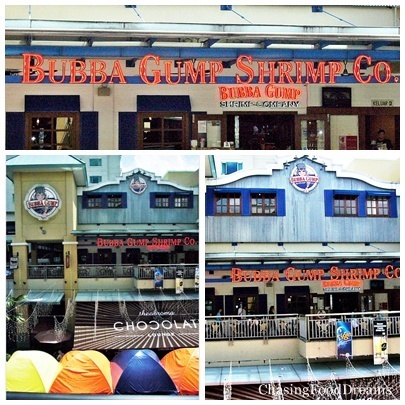 Yeah, I agree Bubba Gump's concept is somewhat familiar to TGIF or Chilies but it does have its own uniqueness to the food and ambience. 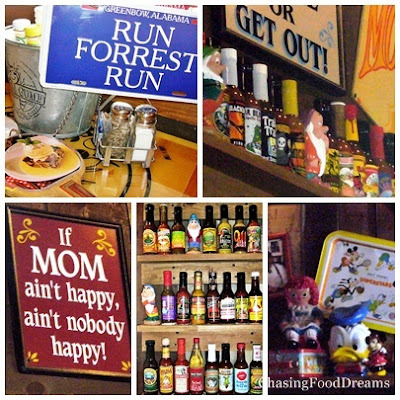 To signal its wait staff, one has to use its signage of Run Forrest Run or Stop Forrest Stop. 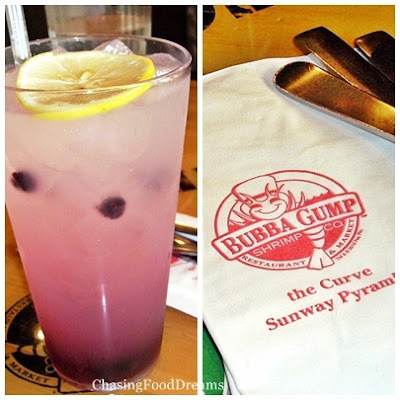 Currently, BGSC has two branches with one in The Curve and the second one in Sunway Pyramid. The company originated from California and features S.H.R.I.M.P in almost every possible way as its main ingredient with the influence of Southern Cajun fair. There are plenty of seafood as well and specialties like BBQ ribs, meat (halal), burgers, etc. Let's dive right in to its menu. As there was only two of us, we decided to order its Run Across America Sampler and Bourbon Street Catch of the Day, which was Tilapia. I also ordered a Speckled Blueberry Lemonnade. First up, Run Across America Sampler is basically a bit of all their specialty appetizers. Oh gosh, the portion is huge! Certainly enough to be shared by at least 4 foodies and well worth its price. 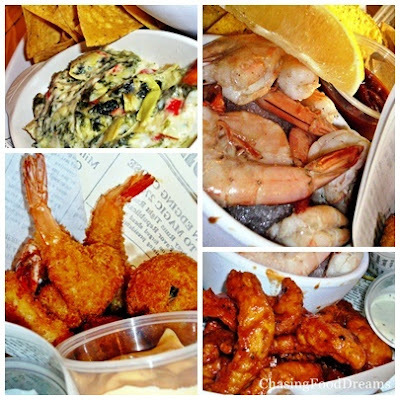 There was Bubba's Far Out Dip & Chips, Chilled Shrimp with Cocktail sauce, Spicy Chicken Strips, Hush Pups, and Mama Blue's Fried Shrimp. Bubba's Far Out Dip & Chips is their signature dip made with spinach, artichokes, red bell peppers and creamy Monterey Jack cheese served with an mammoth amount of crispy tortilla chips. Creamy, tasty and heavenly, the dip was really tasty and the vegetables added the texture to it. Thumbs up for this one! Chilled Shrimp with cocktail sauce was nothing to shout about as it was simply some shrimp basking on a small mountain of crushed ice, a wedge of lemon and a really good cocktail sauce. I have to say that the shrimp was so so as it was not as fresh as expected. Mama Blue's Fried Shrimp was crispy and quite good when dipped in the Remoulade sauce. Hush Pups is what I like. Its is a southern dish of blended shrimp, fish and corn kernels, deep fried to crisp and served piping hot with the Remoulade dipping sauce. Reminds me of our local cucur udang done southern style. Next up was the Bourbon Street Tilapia. When I found out that the catch of the day was tilapia, my first thought was this dish was expensive and tilapia was a very common fish. I was wrong. The portion was big and loaded with a lot of shrimps. Charbroiled, the two huge pieces of tilapia coated with Cajun spice was really good! Firm and sweet, the fish was fresh and I love the rich creamy sauce with bits of tomatoes. Shrimp was more of a supporting star but I love the mash potatoes and its adornment of crispy fried potato sticks. I would order this again. In short, good food and ambience for big groups. Might be $$$ but portions are huge and well worth the price. I will have to say I was thirsty after the meal though. As what Forrest already attested with his famous quote: " My Mama always said 'Life is just like a Box of Chocolates, you never know what 're gonna get!' ", BGSC certainly live up to its tagline! I have been craving for really super spicy food lately and cannot seem to get it off my mind. It kind of stayed with me for almost three weeks before I could finally get to indulge in it. However, being the food glutton I am, it was a hard decision to either pick spicy dishes to go with rice or coddle myself with spicy Mala steamboat. My all time favorite Szechuan restaurant had to be Jin Shan Cheng in KL near Pudu. They do have a branch in Sunway but I still prefer this main restaurant. It was pouring that day but I was not going to let that get in my way! We arrive after lunch time and quickly settled down to order. 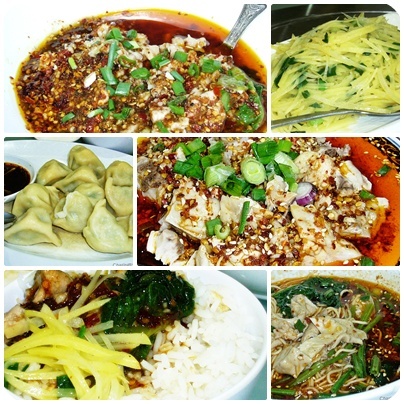 We ordered a spicy Szechuan noodle, two meat dishes, one potato dish and squeeze in a large order of dumpling appetizer. As we went after lunch crowd, our dishes came quickly. First to come was the Spicy Dan Dan Noodle with Pig Stomach & Intestine. Steaming hot, the bowl was filled with wantan noodles topped with pig "spare parts", lots of "choi sum" and spicy aromatic broth. Noodles were springy and broth was really good as it was quite aromatic. The only thing was the "spare part" was not that fresh for one to two pieces. I might order this again to give it another go. Next up was Shredded Potatoes with Scallion Oil. We decided on this simple non-spicy dish as most of our other dishes were spicy. Ever so lightly stir fried, the potato sticks were still bitey with a sprinkle of scallions. The flavour was very light and one could really taste the potato flavour of this simple dish. However, after eating the spicy dishes, this dish seems to fade into the background since the flavour was so light. Spicy Pork Slices cooked in Oil came and it was my favorite of that lunch! I have had this method with fish slices and beef slices in other places but this was the first time with pork. All I can say is one word - Divine! Pork slices were very soft and tasty with its spicy seasoning. Of course, judging by the picture, it could probably give you a heart attack with its amount of oil. All I can say is there is always a price to pay with delicious food and since I only indulge in this once a while, guess I just need to work this off in some other way (the excuses I would make to indulge!). The dish is spicy as there is a serious amount of dried chilies and Szechuan peppercorn to numb your mouth. However, the chef managed to control it well and it was still edible without overdoing it. Spicy Cold Chicken came next and although it looks similar to the pork, it was quite different taste wise. This is a cold appetizer in the menu but the portion was pretty decent. Pieces of boiled chicken were doused in an aromatic and spicy sesame oil sauce. This dish smells really good because of the sesame and nutty flavour in the sauce. Spicyness level was ok for me as well with enough flavour and spice to really perk up a bowl of hot steaming rice. Surprisingly, our appetizer came last. A house specialty, the large order of homemade Boiled Dumpling was served with vinegar and shredded ginger. Steaming hot, the dumplings were really good. The dumplings were stuffed with minced pork and "kau choi" and very well seasoned. Love its comforting taste and flavour. I could just have this as a meal by itself as I really love dumplings! All the dishes went really went with plain rice and I had slightly more than a bowl of rice. It was hard to resist with the spicy dishes and the rainy weather did not help but to add to the total experience. Satiated with the meal, I am so looking forward to my next visit for its spicy Mala steamboat. Environment is simple and nothing to shout about. Price wise, it is not super expensive, neither is it cheap. My only peeve is that they actually charge RM1 for the shrink wrapped set of bowl and plate with utensil! This is certainly a first time for me for any place to charge plate and bowl usage.. guess I may need to bring my own next time.. hahaha. Btw...did I tell you that I am a super piggy fan? Love P.O.R.K to death! 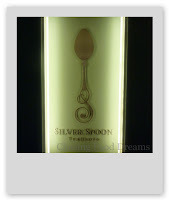 Silver Spoon Trattoria.. Buon Appetito! Have you ever had a day where anything that can go wrong, actually went wrong? Sigh...Oh well, it did gave me a reason to drag someone there to have an awesome lunch! I have been hearing about this really awesome chef, Chef Ken, who had a cafe awhile back in Menjalara area but left to pursue further career in Aussie. Well, he is back! 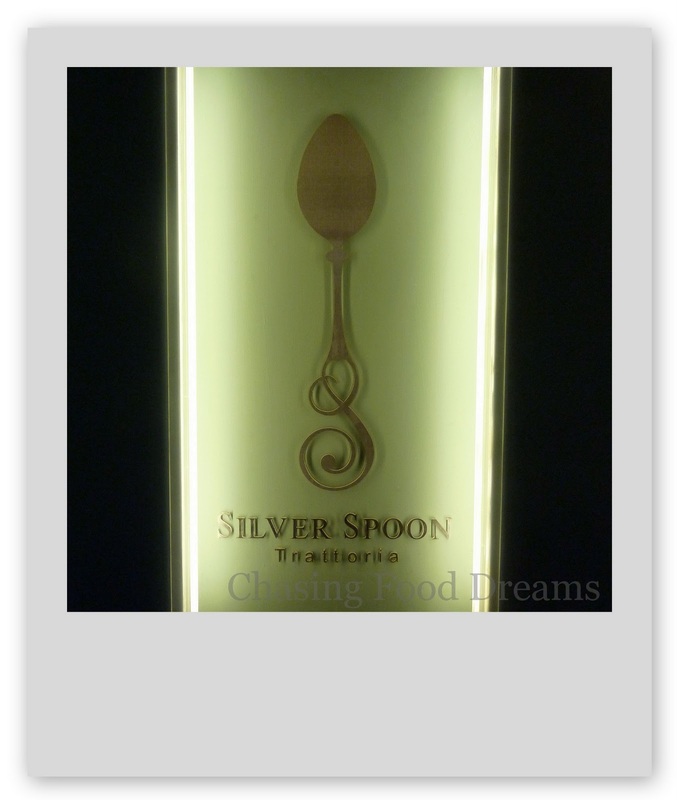 He is the owner of Silver Spoon Trattoria, located in Menjalara square apposite Village Kepong Mall and Tesco. I was really looking forward to this as I have heard many others rave about his food and especially desserts. 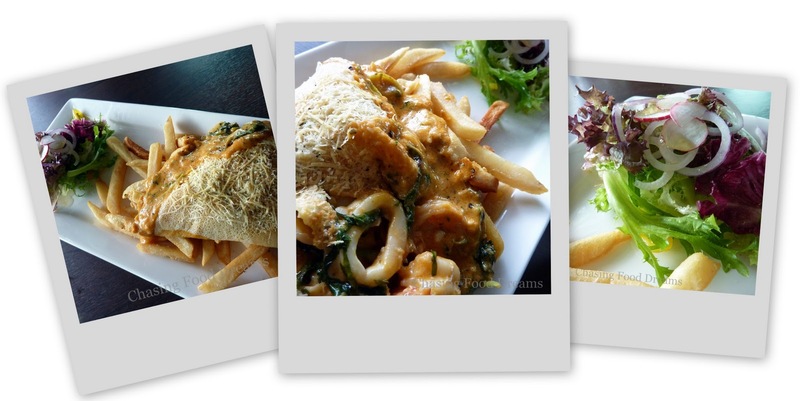 To add to it, he is running a set lunch promotion for a 3-course meal for RM21.90. The moment I step it, I could feel a serene and elegant decor and environment. It was certainly very comforting and inviting that I felt my earlier problems leaving my thoughts. My friend and I decided to order everything different to be able to try out its choices. There were four choices of entrees. We both started with entrees of Crumbed Calamari and Stuff Mushroom. Both entrees sounded so simple and yet we just loved it! 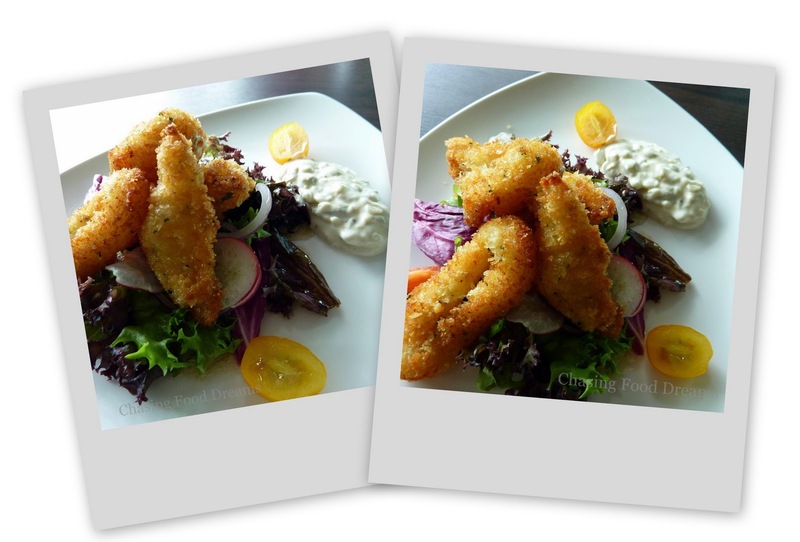 Four pieces of tender and perfectly breaded fried golden calamari pieces that is served with a mesclun salad and a homemade tartare sauce. Juicy and ever so lightly fried, the taste was light and simply irresistable. The salad provided a beautiful accompaniment to lighten up the fried calamari and its tasty tartare sauce. Stuff Mushroom was another simple but juicy entree, which has a Portabello mushroom stuffed and grilled. I love the fact that they served this with mesclun salad as it helps to lighten the entree again. Salad was simply dressed with oil and a balsamic vinegar reduction. Overall taste was well balanced with salty and smoky flavours of the mushroom being the star of the show. We had a hard time on deciding the Main Course as there were so many choices. This is an added point as I believe that the chef was really thoughtful in giving varieties to its customers. There were nine choices altogether for Mains, ranging from pizzas, pasta to chicken, and seafood. 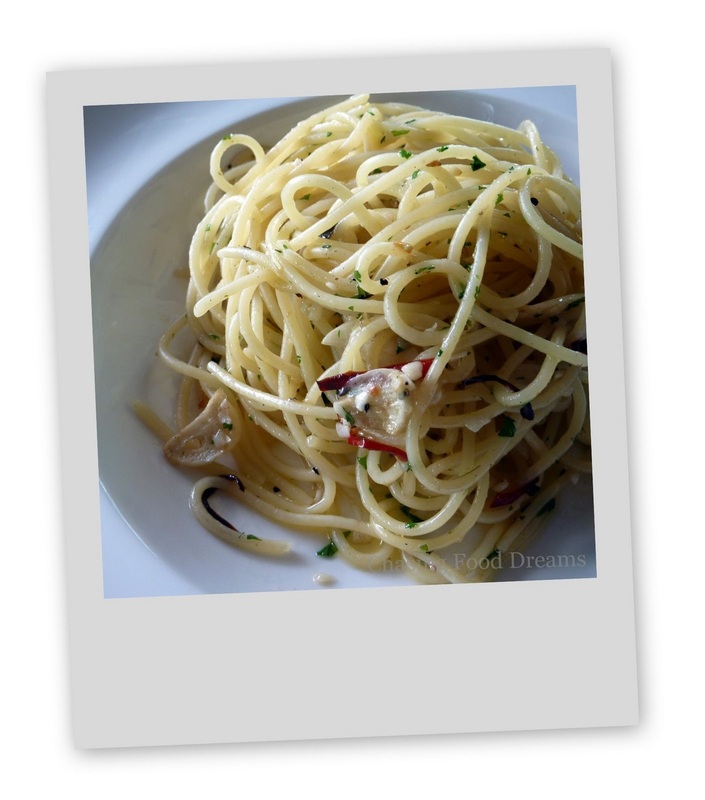 My friend decided to go with the most simple and basic of pasta - Spaghetti Aglio E Olio Con Peperoncino. He deemed that the most simple dish is usually the hardest to make. I selected a Seafood Crepes as I thought it was quite unusual and this is not found on most set lunch. Spaghetti Aglio came first. As seen in the picture, a very basic pasta lightly doused in olive oil, garlic, parsley and chilli. A bit bland and we both thought it could be a bit more tastier but I like the fact that the pasta was really Al Dente. I have saved the best for last. No wonder people raved about his desserts! I am a truly convinced fan of Chef Ken's desserts! There were four choices and we selected Chocolate Mouse and Panna Cotta. 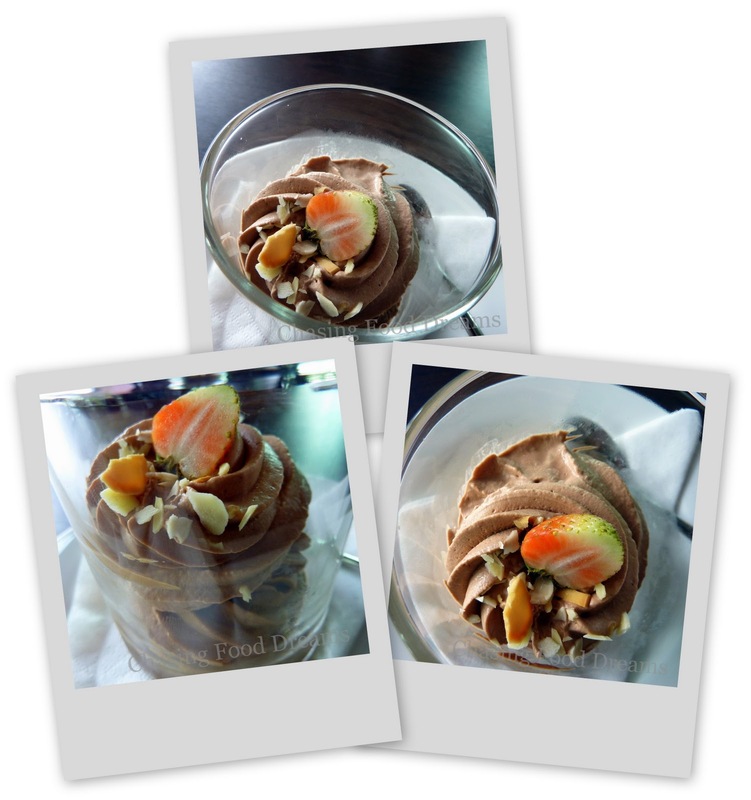 I have had chocolate mousse before and did not think much of it. However, this one blew me away. Looks are so deceiving. When I took a first bite of the mousse, all I could think of was that this is the BEST mousse that I have ever had. It was chocolatey, smooth, creamy but not over, and laced with a sufficient amount of Rum, sigh... this was sheer pleasure. I wanted to keep the whole dessert for myself. 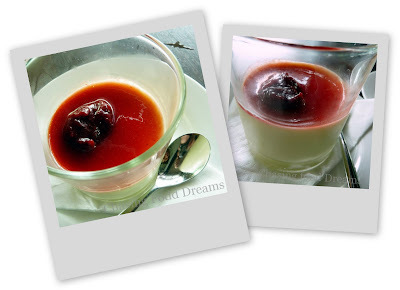 Panna Cotta was another dessert that I have brushed off as it was just baked cream. The ones I had before was simply cream with gelatin. This one was really an eye opener as I felt that this is what Panna Cotta should be. This one will set the standard for my future Panna Cottas! Ultra smooth and one can really taste the beautiful baked cream without the gelatin texture. It was topped with a strawberry coulis. Simply divine! After desserts, I actuallly felt I could survive this "wrong" day! Our meal came up to a totaled of RM 48.20. I am definately going back as I was checking out the full menu and desserts are gonna be top of my list. Good food and value for money. You know that dish that brings back memories of comfort and happiness each time you savor it? This is mine! When I was growing up, funds were limited and birthday celebrations are deemed luxury in our household. Nevertheless, each birthday in our family, mom would get up early and make this special noodle dish for the birthday member. I never gave much thought to it till I was away from home. Then each time of the year, I would crave for this bowl of memories and finally called my mom to learn to cook this dish. It’s a very simple dish of noodles and soup, filled with many accompaniments and a very spicy chili. The dish is called "Lam Mee" or Birthday Mee as deemed by my family. This also seems to be a northern dish as the dish actually changes into a different variation further down south of Malaysia. This bowl of goodness has a broth made from chicken, pork, prawn and dried scallop, boiled down to produce a luxurious stock brimming with natural sweetness and savory flavours. I would top a bowl of blanched yellow noodles and bean sprout, piled in all (and extra) the accompaniments, ladled in hot broth, and finally top with fried shallots, garlic, spring onions and coriander. I would inhaled in the glorious smell and digged in with gusto by adding spicy belachan chilli paste (hand-pounded by mom, of course!). You are probably wondering what is so difficult about this dish. I didn’t think much of it either till I had to make it. Gosh, it took me half a day to just prepare the dish and prepare all the different accompaniments. After finally going through the experience, I have to admit that I really felt the love and effort from my mom into making this dish for us each year. Now I finally understand why it’s called Birthday Mee and the warm comfy feeling it brings to me when I savor every strand of noodle and sip its glorious broth! * If you would like to have the recipe, leave a comment for me to send it to you. I love FOOD. Period! I love to eat. I love to cook. I love to read and talk about it until I can almost feel like I m always chasing food dreams..